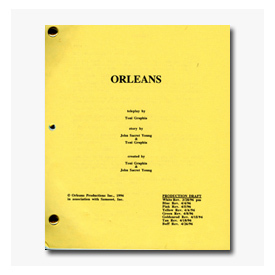 Below are some of Larry's scripts from his various television and film projects. In most cases we only have one script of each available. Please read the description carefully for which script you are ordering. Scripts available are entilted: Reel Life, The Call of the Wild, April Showers, Charade, The Dove Hunt, Terminus, Brothers and Sisters, April in Paris, War and Love and the Whole Damn Thing, Divorce Ewing Style, Hell's Fury, The Switch, Mission to Moscow, The Two Mrs. Ewings, Dead Reckoning, Cally on a Hot Tin Roof, The Way We Were, Requiem, Comings and Goings, Country Girl, Wedding Bell Blues, Malice in Dallas and The Best Laid Plans. 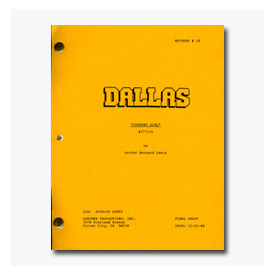 Each Dallas script sells for $50.00. 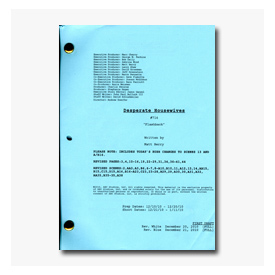 Scripts available are from Desperate Housewives episode Flashback. Each script sells for $50.00. Order your script using the below PayPal button. Scripts titles available are from the pilot episode.